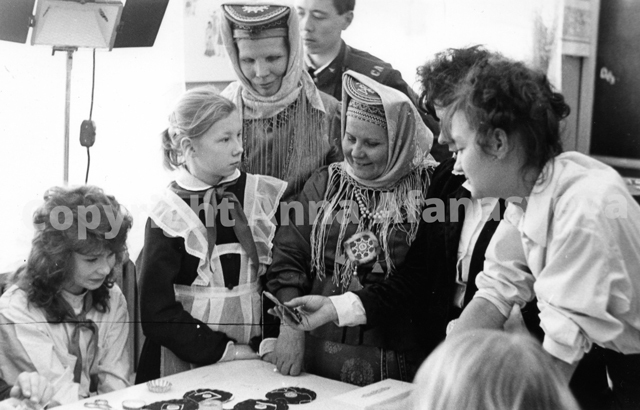 The Sámi cultural week in the school of Tumannyj village (1982), the Kola Peninsula in the Northwestern Russia. Photo: Private archives of Anna Afanasieva. The current Ph.D. project explores boarding school policies in education of the Kola Sámi people from 1935 to 1989, its historical development and consequences. To investigate the process of implementation and the consequences of boarding school policies introduced to education of the Kola Sami people during the Soviet Era (1935-1989). To investigate the Kola Sami situation in the frame of indigenous research methodologies and using already existing research experiences and perspectives reflected in studies on the Sami in Norway and the Native American Tribes in Montana, U.S.A. If at one time ethnographers tended to romanticize traditional communities, placing them outside of history, contemporary social and anthropological research is now becoming focused on the historical and social influences of particular relationships. This project will analyze the implementation and consequences of educational policies introduced on the Kola Sami people in the Northwestern Russia in the late Imperial and the Soviet periods. The aim of this project is to trace the impacts of a certain policy event in the history of the Sami people, focusing on development of education policies in a particular historical period and its impacts on cultural assimilation. The study will scrutinize the mentioned processes from the point of view of its historical evolution, using an interdisciplinary approach in relation to the existing knowledge on the topic. The primary focus will be devoted to an analysis of educational measures introduced in boarding schools of the Kola Peninsula. One of the tasks in this project is devoted to examination of community-oriented approaches in research related to indigenous communities in Norway and in Montana, U.S.A. This focus will help to analyze and examine the process of the development of education policies and its consequences on the Kola Sami in the frame of various experiences and socio-cultural perspectives. The similar policies have been introduced in the above-mentioned indigenous communities and contexts, though in different states, time periods and geographical locations. This Ph.D. research will synthesize systematic historical knowledge with an emphasis on socio-cultural information, contributing to a better understanding of the policy of assimilation in education in Kola Sami communities and will be of a value for historians, anthropologists, and various specialists in the field of indigenous research and Northern Circumpolar studies. Academic supervisor: Kari Aga Myklebost, UIT The Arctic University of Tromso. Secondary academic supervisor: Marianne Neerland Solheim, UIT The Arctic University of Tromso. The project's author: Anna Afanasieva, UIT The Arctic University of Tromso.